Blaze a trail through this obscure country of epic landscapes - a vast, empty, and mostly untouched swathe of Central Asia. Remote mountains and glittering lakes punctuate the endless steppe in the world’s ninth largest country, where the gleaming capital is a shrine to bold modernism and the people are genuinely welcoming. One of the big attractions of a trip to Kazakhstan is its low tourist footfall, meaning that you get to experience the culture undiluted and with minimal overseas influence. Blaze a trail among pristine natural attractions, buzzing bazaars and historic monuments where few tourists have ventured. The empty landscapes are enough to take your breath away - the steppes and mountain ranges give way to shimmering lakes and desert canyons. 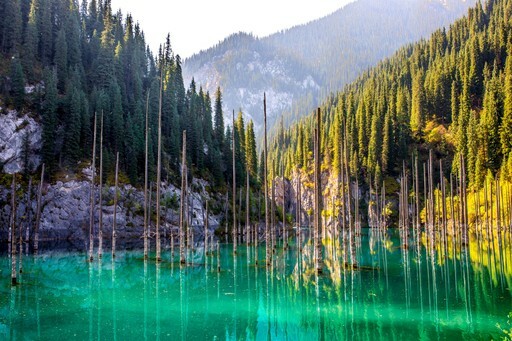 If you tire of all that jaw-dropping beauty, head to Almaty where you can indulge in luxury hotels and fine dining. There are many wonderful experiences to be had in this ancient Central Asian land. 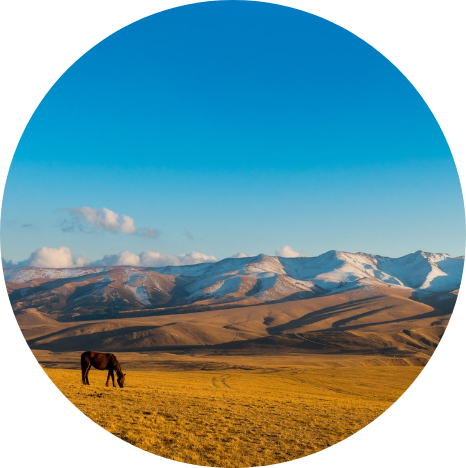 For further inspiration take a look at the trip ideas put together by our trusted local experts at the foot of this page, but in the meantime here are our top three things to do in Kazakhstan. 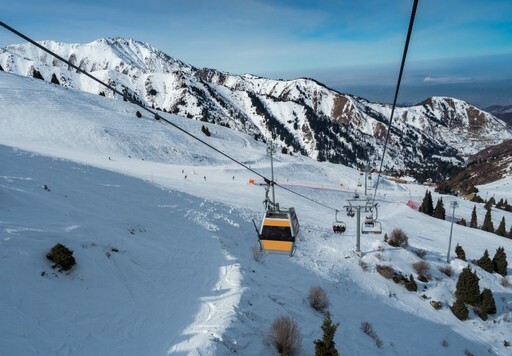 The high-end mountain resort of Shymbulak is within a half hour drive from Almaty, Kazakhstan's biggest city, and provides some of the best skiing in Central Asia. Take a ride on one of the cable cars and admire snow-cloaked peaks topping 3,000 metres. While the slopes aren't hugely challenging, they're perfect for learners and great for a few days break from a cultural trip to the more bustling areas. The best months to go skiing in Kazakhstan are September and October. 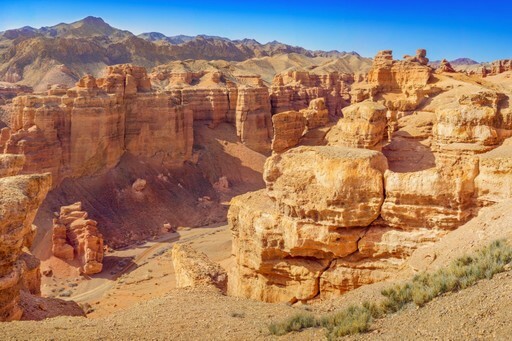 Also known as the ‘Grand Canyon’s little brother’, Charyn Canyon is truly spectacular. The 12 million year old gorge is tucked between mountain ranges and was formed over millennia by the wind carving fantastic shapes from the rock. The famous Charyn River rapids offer some of the best white-water rafting in Asia, but you can just look if you prefer! To make the trip truly memorable, camp overnight in a yurt and make sure you’re up for sunrise. One of Kazakhstan's most scenic lakes, Lake Kaindy, is tucked into the Tien Shan mountains and well worth a day trip. It is far from ancient, having been formed by a landslide caused by an earthquake in the early 20th Century. As the valley slowly filled with water, the spruces that previously coated the valley were submerged and their poker-straight bleached trunks are all that remain today. The lake varies in colour from emerald green to turquoise blue dependent on the weather, making for some stunning photographs. When should I visit Kazakhstan? Kazakhstan has extreme seasons so plan your trip carefully. The hottest months are July and August, and the coldest between November and March. In midwinter temperatures can plunge below minus 20 degrees celsius; Kazakhstan is said to be snow-covered for roughly 111 days a year so be sure to pack warm layers whenever you visit. The best months for skiing are September and October and for hiking come between May and September to enjoy crisp fresh air, whilst avoiding the winter freeze. Create your bespoke holiday to Kazakhstan!